I found some cheerful non chocolate advent calendars that can help make advent a more joyous occasion for everyone. Each of these is a deal at the moment and are all priced under six dollars making them an easy addition to your current holiday shopping. Make sure to pick one up early so that the person you are giving it to has enough to time to fully enjoy opening the boxes each day without having to play catch up by opening multiple at a time. See more Calendar options here. 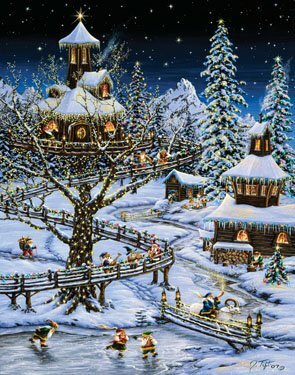 Each of these picture advent calendars for the holidays has special pictures under each flap along with a verse from ‘Twas the Night Before Christmas. The variety among the scenic displays allows you to pick the ones you think will best suit each of your loved ones. 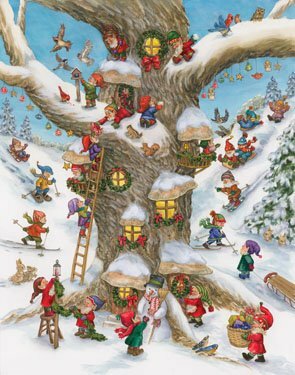 I adore the Santa Claus calendar mainly because he has cats! I have two cats as well and that is exactly what they would be doing. 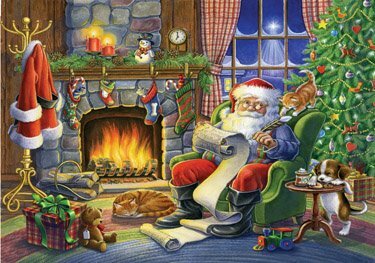 One cat sleeping on the floor and the other cat playing with his feather quill while he writes up his naughty and nice list. As a kid I always got the chocolate calendars from church but I think these are a great idea for those who do not like chocolate or who would like to limit the intake of extra sweets during the season. Until recently, I hadn’t seen non treat (well non edible treat) ones except with the mini advent calendar cards that you can give out in replacement of a traditional Christmas card. I have also never seen them with lyrics in them before which is a great motivation to keep looking forward to the next day.